We are an open red tent, and welcome all women to come join our circle. We gather on the evening of the first slither of the new moon. We use the space for contemplation, a place of stillness and reflection. A time for us to rest and gather our energies, away from the hustle and bustle of everyday life. To share stories, songs, laughter and tears. A place to recognize and honor our sacred feminine aspects. Connecting with the rhythms of nature and universal energies. Our intention is to create a loving space where women feel safe, and can speak their truth, and share openly with their sisters. Sometimes we will have a specific creative focus, modeling, painting, weaving, etc, and sometimes we just need to talk and drink tea. The red tent evolves depending on the needs of those who come, and will continue to change and develop as women come and go. This red tent is an adult women only space, but we also hold special red tents throughout the year which are also open to girls who have started bleeding, bringing them into the red tent tradition. 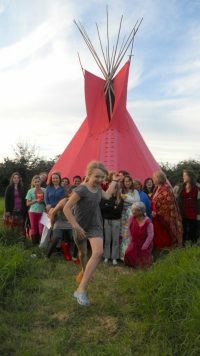 We also hold an annual women and girls camp for women and girls over the age of ten in the summer called the Danu Camp. other women and find a piece of our self in each connection.